Sunday 21st September 2014 was a historic day in climate change policy. 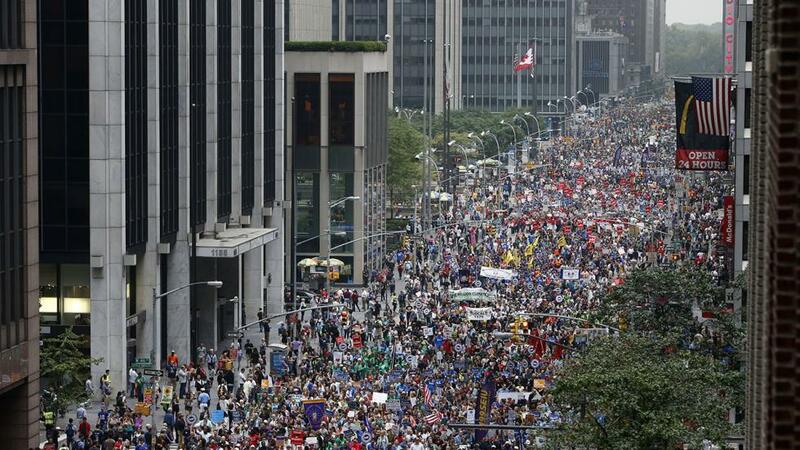 With over 400,000 people in attendance, the People’s Climate March became the largest march on climate change in history. I arrived at Central Park before 11:30, and even on the subway, I could tell it was going to be huge. I was coming there from Queens, and I saw people wearing shirts with logos of organizations promoting climate change policy and holding signs on the E train. By the time we got off at 53rd Street to transfer to the D train, the subway was mostly packed with Climate March goers. Many of the subway riders got off at 72nd Street-Central Park, causing a blockage going up the stairs – no one could go to the station or get out of the station for a couple minutes while dealing with the sheer volume of protesters. Once I was finally able to make it to the surface, I was already astounded by the number and diversity of the people in attendance. People of all ages and backgrounds came in full force, many holding signs. Many demonstrators got creative, holding signs with slogans like, “Look Ma, no future!” and wearing costumes of bees and narwhals (say what?). People’s Climate volunteers even brought a parachute with their logo on it, allowing kids to run through when it billowed up. I saw at least two floats of the world, one of which even had solar panels, though its ability to actually produce energy can be questioned. At noon, the huge crowd went silent, raising their fists in the air. After a few seconds, all you could hear was a wave of noise marking the start of the march. That was the most thrilling part of the march for me. Remembering it and seeing a lot of people in solidarity for climate change reform made the ache in my dehydrated body worth it. I recall reading that the last protesters didn’t even start marching when the first group of marchers reached the Javits Center; they finished after 5PM, showing how dedicated they were in getting things to change. Several corporations went all out, giving protesters free gifts, such as megaphones, posters, and pinwheels that looked like small wind turbines. There were leftovers freebies all over, which made me a little miffed. That same feeling rose up when I saw signs saying, “I came from (insert state here) for climate change reform!” Don’t you think it’s counter-intuitive to create pollution jetting over here to demonstrate over environmental policy? There were plenty of other (and possibly closer) marches happening with the People’s Climate March, so it’s not as if the event in New York was an isolated one. With almost 2,700 demonstrations worldwide that weekend, I’m sure world leaders got the message. This week was the opening of the 69thGeneral Assembly of the United Nations, and celebrities, such as Leonardo Dicaprio, as well as world leaders made speeches on climate change. It would be interesting for me to see if this march leads to solid reform on the legislative side AND on the lives of the people who marched. While I think the march had its heart in the right place, I feel that raising awareness is never enough. It did get the message through, but unless everyone in attendance is willing to change their lifestyles to be more environmentally friendly, policy makers will only view this march as sort of an isolated incident. The People’s Climate March is only the first step in getting anything done in climate change policy.